The Major Seminary welcomes candidates for the ministerial priesthood and offers them a programme of formation in conformity with the mind of the Catholic Church and with due consideration of the needs and potentials of the local Christian Community. It provides the students with the appropriate environment to pursue their vocation and acquire the human, spiritual, theological and pastoral formation, essential to the formation in pastoral charity and to carry out effectively the ministry of the Catholic priesthood. The Seminary seeks to support them in the growth of that fraternal unity which binds the diocesan presbyterium with the ordinary bishop, as well as in the awareness of the multi-cultural milieau of contemporary society and a particular sense of universal mission. Also, it fosters the new vocations and supports the on-going formation of priests. On 4 November 1866, His Lordship Bishop Paolo Micallef, Apostolic Administrator for Gozo, officially inaugurated the Gozo Seminary. It was an event that slowly but surely revolutionized the religious, cultural, and intellectual life of the island. The foundation of the Gozo Seminary is closely related to the establishment of the diocese of Gozo. On 16 September 1864, through the Bull Singulari Amore, Pope Pius IX dismembered the islands of Gozo and Comino from the diocese of Malta and erected them into a separate independent diocese. The same Bull laid down that the ecclesiastical authorities should in the least possible time open a Seminary.In one of its reform decrees, the Council of Trent had prescribed the opening of colleges for the preparation of youth to the priesthood in every diocese. The promoters of the new diocese had of course full knowledge of this enactment, but it might as well had not been made. In fact, one reason why they were pressing for a diocese was precisely because they rightly hoped that its establishment would bring about the opening of a seminary together with a secondary school. Hence the provision for such an institution was indispensable. The related problems were threefold. The first was the eternal problem of all projects, the raising of enough funds for its establishment and running. The second concerned the building that could accommodate such a seminary. The third problem was related to the provision of the staff for the institution. None of the three was an easy task considering that the population of the island at that time was just 16,000 and that hardly any secondary education worthy of mention was imparted on the island. Yet the undaunted promoter of the project was convinced that no obstacle was so great that it could not be surmounted. He was Father Pietro Pace (1831–1914), a priest from Rabat, who never lost an occasion in his lifetime to promote his island home. He tackled the first two problems at one go. No place for a Seminary was as ideal as the Saint Julian Hospital for women. At the time it had lost most of its scope, as in 1837, a Commission of Inquiry instituted by the Department of Charitable Institutions recommended the opening of the Saint John the Baptist Hospital for men to patients of both sexes. This hospital, situated just across the street from Saint Julian’s, had been inaugurated on 14 October 1729. Female patients began to be admitted from the beginning of 1838. Saint Julian’s could thus be declared superfluous and its revenues diverted to an equally noble scope: the new seminary. The Saint Julian Hospital knows its origin to the munificence of several persons who in 1778 decided to erect a new hospital for women on the island of Gozo. The old Saint Julian Hospital within the fortified Citadel, founded on 22 February 1454, was proving itself inadequate and too small. The new venture was made possible through a sizable donation of the Grand Prior of the Conventual Church of Saint John in Valletta, Fra Melchior Alferan, through bequests of the Reverend Joseph Agius and his sister Rose Pluman, and, finally, due to the encouragement and material and moral help of His Lordship Vincenzo Labini, Bishop of Malta and Gozo, who promised to meet one third of all costs. Their portraits occupy a prominent place in one of the Seminary halls. The Gozitans fully patronized the project donating cotton and agricultural produce to fund the building. Construction works started on 9 March 1782 under capomastro Antonio Cachia. The people continued to contribute generously and many offered a day’s work without remuneration. The foundation stone of the new hospital was laid by Bishop Labini on 3 May 1783, feast of the Invention of the Cross. The bishop arrived processionally on the spot accompanied by the Chapter of the Matrice, the secular and regular clergy, that is those belonging to the Augustinian, Franciscan and Capuchin Orders, the members of all the confraternities of Rabat and a very large congregation. The foundation stone suspended from two poles adorned with banners and palm branches was in a corner to the left of what was to become the main entrance. As soon as the bishop blessed the stone and began to lower it into position, the bells of the churches of Rabat pealed joyously in unision. Construction progressed briskly and under the direction of the procurator Don Ìammarija Cauchi, and before long the hospital began to take shape. Construction costs amounted to 6469 Scudi 7 tarì14 grani (£540), a considerable sum at the time. The main door was placed on 20 April 1787 and before long the new Saint Julian Hospital could receive the first sick women. The main wing was made up of two wards in the form of the letter L annexed at right angles; they could accommodate fifty patients. Eventually some beds were set aside for incurables, and on occasions mothers with problematic pregnancies were also admitted. The hospital also provided foundling facilities. Babies could be placed anonymously from outside the hospital in a ruota or rotating box which once turned made it possible for the hospital staff to pick the crying baby from inside. The Holy See pondered at length the pros and cons of the Gozitan suggestion concerning the hospital. Finally it acceded to their wish. The Bull Singulari Amore stipulated the foundation of the Seminary in Saint Julian Hospital. The last patient left the hospital on 30 November 1864. The new bishop of Gozo, His Lordship Michele Buttigieg, promoted Father Pace as his Vicar General and his initial and principal task was precisely the setting up of the Seminary. He engaged a Roman architect to prepare a plan for its conversion and work soon got under way. Once the first two problems concerning the funding and the building were solved, Bishop Buttigieg and Monsignor Pietro Pace tackled the question of staff. The Seminary was intended to fill a twofold scope from the beginning: a faculty of Philosophy and Theology for students who wanted to proceed to the priesthood, and a proper secondary school that was direly needed on the island. It was no easy job to engage the right staff. Yet on this count they had the not insignificant support of Pierre-Jean Beckx, the Superior General of the Society of Jesus. On 28 May 1865, Bishop Buttigieg proposed to Beckx to authorize the Sicilian Jesuits, dispersed by the revolution of Garibaldi in 1860, to take over the direction and staffing of the Seminary. Beckx immediately directed Pietro Fontana, the Provincial of the Sicilian Province, to proffer all the necessary help. In April 1866 Father Fontana travelled to Gozo to conclude the agreement between the Diocese of Gozo and the Society of Jesus. The pact was signed at the Bishop’s residence in Rabat, Gozo, on 25 April 1866, by Bishop Buttigieg, on behalf of the diocese, and Father Fontana, on behalf of the Order’s General Jean-Pierre Beckx. In fourteen points, they laid down the norms that were to govern the relationship between them in the following years. By mid-1866, the conversion was ready and on 11 September 1866, three Jesuits arrived from Sicily to assume responsibility: Antonino Tommasi, eventually appointed first Rector and Procurator; Salvatore Dipietro, first Minister or Administrator of the house and the community as well as master of mathematics, physics, and natural history; and Brother Antonio Ardagna, the chef. The whole staff made up of nine priests, a scholastic, and five brothers was in Gozo by the middle of the following month. Bishop Buttigieg, who had worked so hard to set this new venture on a good solid basis, unfortunately died the previous July and the official opening was delayed until the election of his successor. The inauguration eventually took place on 4 November 1866 in the afternoon. The ceremony was presided over by His Lordship Paolo Micallef OESA, the new Apostolic Administrator for Gozo, and Pietro Fontana SJ, the Provincial of the Sicilian Province of the Society of Jesus. The inauguration address, was delivered by Monsignor Pietro Pace, the mind behind the project. On the previous 15 September, he had blessed and said the first mass in the new chapel of the Seminary. As a memory of the inauguration three large marble coats-of-arms were placed over the main entrance of the Seminario del Gozo: that of Pope Pius IX, flanked by those of Bishop Labini on the left and that of Bishop Buttigieg on the right. The chapel, initially dedicated to Saint Julian was on 8 December of that same year rededicated to the Immaculate Conception. That day, the spiritual director, Salvatore Spinelli SJ, founded the Marian Congregation. During the first year, the number of students in both sections of the Seminary rose to one hundred: 52 Gozitans and 48 hailing from Malta. Sixty six of these were boarders. The Jesuits did much to enhance the standard of education in Gozo, and indeed, the reputation of this school spread far and wide. So much so, that from the very beginning, not only the sons of the best families in Gozo, but also many intellectually talented boys from Malta, and even from Sicily, attended the Jesuit-run Seminary. In the Seminary’s secondary school or minor Seminary, boys were prepared for the University of Malta Matriculation Examination, and many were those who obtained brilliant results. The faculty of Philosophy and Theology or major Seminary made a very good name for itself for the seriousness and high standard of its studies and for the number of holy and zealous priests it turned out. On 24 June 1881, during the rectorship of Vincenzo Deccoradi SJ, the Seminary was solemnly consecrated to the Sacred Heart of Jesus, and henceforth named Seminarium Gaudisiense SS. Cordis Iesu or Sacred Heart Seminary. In line with their policy, the Jesuits did not cater only for the intellectual and spiritual advancement of their students. They also sought to widen their cultural interests. In a few years, the Seminary became the centre of the major cultural activities of the diocese and of the island itself. The Jesuits held meetings of all sorts for priests, gave public lectures and talks, organized large-scale exhibitions on a variety of subjects, and produced dramatic shows for people at large. Many even crossed over from Malta to participate and enjoy these activities. On 1 November 1882, the Seminary entered the international scene with the inauguration of a Meterological Observatory in a specially built wing. It was immediately affiliated as the 170th station of the Rete Meterologica Italiana. The reports of the station, which operated until 1909, were from 1885 published in the prestigious Summary and Review of International Meteorological Observations issued monthly by the United States War Department, Washington DC. In August 1909, the Jesuits passed the running and administration of the Seminary to His Lordship Giovanni Maria Camilleri, the bishop of Gozo, who delegated its direction to diocesan priests. Under the guidance of Bishop Camilleri and his successors, the Seminary continued to enjoy the good name it originally achieved. The immense influence of the Seminary in the educational, religious, and cultural fields during the past one hundred and twenty five years cannot be fathomed particularly when one realizes that for a long time it was practically the only secondary school on the island worthy of that name. Almost 600 Gozitan priests and many others from Malta have been trained there. 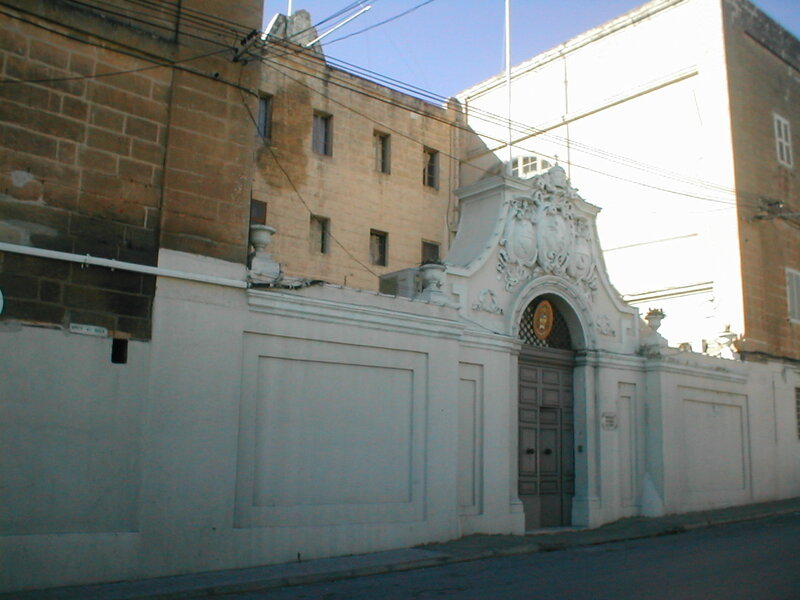 The Gozo Seminary is proud to number among its ex-alumni two Presidents of the Republic, Anton Buttigieg and Ċensu Tabone; several bishops; a Prime Minister, Enrico Mizzi — after whom the street on which the Seminary stands is named; and a host of politicians, men of profession, civil servants, and businessmen. The minor Seminary proceeds to attract to it many young intelligent students. And as in the far off years, when it pioneered so many courses of study in Gozo, from Astronomy to Zoology, from Physics to Intuitive Geometry, it still leads in many a field. It was the Seminary who for the first time introduced computer courses to all students from the third form onwards. A modern audio-visual room was also set up and school leavers are each year given the opportunity to produce a video documentary on some socio-cultural subject. Since last year, students are being introduced to the Systems of Knowledge syllabus from the lower forms. The minor Seminary now caters for the education of some 260 students. The major Seminary too proceeds with its mission to train the young men of Gozo who choose to follow Christ in the priesthood. It is indeed an honour for the diocese and for Gozo that most lecturers, regular and visiting, are Gozitan priests — all of which were given the opportunity to study abroad by His Lordship Mgr. Nikol Cauchi, bishop emeritus of Gozo. The overall conditions of the Seminary as well as those of seminarians and lecturers has been bettered by leaps and bounds in the last score of years, though, of course, there is always space for improvement. In line with the axiom the world is my parish, Seminarians are prepared from their training years to look beyond the shores of Gozo and many of them have fruitfully performed pastoral work or furthered their studies abroad. Quite a number decided to stay for good to fulfill their mission where the ministers of Christ are not as bountiful as at home. One hundred and fifty two years after its foundation, the Sacred Heart Seminary is still going strong. No mean thing considering its location on a tiny island just 67 square kilometers with a population that from 1866 to date has risen from just 16,000 to around 29,500. Truly enough the Seminary is small in size, and those studying there are not a multitude; yet proportionally it is one of the largest in the world. Its continued existence is little short of a miracle! In the decree Optatam Totius, concerning priestly formation, the Second Vatican Council regards the Seminary as the heart of the diocese (parag 5). If this is true for every Seminary around the world, it is especially true for the institution on tiny Gozo. For it is the care that the Gozo community has constantly nurtured to her heart that prolonged its life to such length. May the Seminary continue to be the heart of Gozo for many years to come! If it is true for every Seminary around the world, it is especially true for the institution on tiny Gozo. For it is the care that the Gozo community has constantly nurtured to her heart that prolonged its life to such length. May the Seminary continue to be the heart of Gozo for many years to come!